Buckwheat growing at Khadigar Farm. Photo by Will Bonsall. 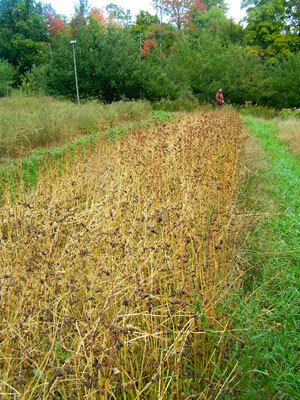 Gardeners rarely include buckwheat among their garden crops, except occasionally as a green manure. That’s not a bad idea, although often not the best. For soil that already has a modicum of fertility, other green manures – oats, for example – return more on a given investment. Buckwheat has a more specialized role – e.g., when soil fertility, especially humus, is very low (so that in effect you have very little to invest); when certain minerals, particularly phosphorus, are low; or when an intractable weed problem, such as quackgrass, needs to be smothered. Aside from those specialized uses, buckwheat has a more obvious use as food. I suspect more people don’t view it that way because they assume it would take a lot more space than they have to be worth the effort, or they don’t know how to process it once they have grown it. The first concern depends on how much you think it takes to be “worth it.” For the second concern I have a remedy. There are two species of buckwheat: common or Japanese buckwheat (Fagopyron esculentum) and tartary buckwheat (F. tartaricum). Tartary is the type grown in the St. John’s Valley in rotation with potatoes. It is used to make the traditional Acadian flapjacks, or “ployes.” Unfortunately, its hull is terribly bitter; even tiny bits ruin the taste of flour. Roller-milling instead of grinding alleviates this problem: In buckwheat mills the whole grain is fed between two coarsely-set grooved rollers that crush rather than grind the kernels, leaving the squeezed-out hulls intact. In fact I once spotted a pile of buckwheat hulls in a buckwheat mill I was visiting. Thinking them to be whole seed, I grabbed a handful only to discover that they were mere hollow husks! 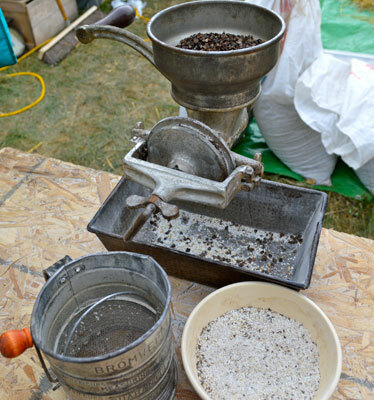 Mike Bouchard grinds buckwheat to make flour, at the Common Ground Country Fair. English photo. By a combination of ever-finer rolling and sifting, all the flour is removed without a trace of bitter hull fragment – which also removes the germ and bran (this is how wheat millers make white flour), so some important nutrients are missing. For making truly whole-grain buckwheat flour, tartary buckwheat is unsuitable. Common, or Japanese, buckwheat hulls do not have the extreme bitterness of the tartary type. The hulls are still coarse and fibrous and must be removed, but a tiny amount of finely-ground hull does no harm to the flavor or texture of the flour. In fact, the tiny dark flecks give most buckwheat flour its distinctive appearance. That product can be made very easily at home with your own home-grown buckwheat and in your own kitchen. All you need is a hand-cranked grain mill, such as the Corona. The burrs, or grinding plates, of some hand-mills are made of synthetic stone instead of steel. Stone burrs may have some advantages, but I prefer the steel burrs for their great versatility: I can grind oil-seeds, make garlic powder and paprika, and lots of other specialty items. If I adjust the outer burr-plate just a little bit loose, the kernels will be ground quite fine while the hulls will be crushed coarsely enough that most will be removed by the sifter. I usually find the flour to be fine enough at that stage, but if I need it even finer I can grind it again, now that nearly all the objectionable material has been removed. Because the germ and bran are still contained, buckwheat flour is as perishable as whole-wheat flour. Fortunately this funky technology allows us to make small batches whenever we want, something a more elaborate setup would not permit. So this is a simple, practical way to grow and make your own buckwheat flour, but what about my favorite buckwheat food, kasha (the roasted groats), or whole kernels? No grinding or sifting can help us here. The commercial process involves prescreening the grain to sort it by size, then passing it between burrs set precisely so that the hulls are barked off without cracking the grain too much. Kernels that do get damaged in this process can be further milled into flour as a byproduct. I know of no practical way to do that at home; woe is me. Another dearly-beloved (by me) buckwheat product is soba noodles. (“Soba” is Japanese for buckwheat.) Commercially they are made from 100 percent buckwheat, or with up to 20 percent wheat flour (durum, I assume, for the high gluten content). The problem I’ve had with 100 percent buckwheat is that it contains no gluten, so the dough is extremely difficult to handle in the pasta maker. With 80 percent buckwheat I have much better luck, but I still think there’s some trick to “conditioning” the dough, and I’m still tweaking it. Unlike most cereal crops, buckwheat is not the slightest bit frost-hardy, but that is no problem: It matures in nine to 12 weeks, so it can be sown as late as mid-July for an assured crop. Indeed its frost-tenderness can be used to advantage, as I’ll explain. When I’m growing buckwheat for a food crop (as opposed to green manure), I choose land that is reasonably weed-free and not overly fertile (but not too poor; that’s the job for green manure). Good drainage is important. For maximum grain yield, I drill (using my Earthway seeder) rather than broadcast the seed; I want it to branch freely and, unlike a cover crop, I’m not counting on it to smother weeds (although it will tend to do that anyway). Cultivation of any kind should be unnecessary; weeds that do emerge will not affect the crop much; indeed they will be suppressed by the crop. Fresh buckwheat flour. English photo. As soon as the plants begin to flower, they will attract the attention of every honeybee in the neighborhood. That’s good regardless of whether you keep bees for their honey. Although buckwheat itself does not depend on them for its pollination, many other crops do, and by strengthening the hives (wild or domestic), you will enable the bees to do their essential work more thoroughly. Nor will the buckwheat distract them from their other work, since the later flowering of buckwheat does not conflict with the needs of other crops, but rather fills out the nectar season. Don’t be intimidated by working in and around the buckwheat while it is teeming with honeybees; they’re far too occupied to take offense at you. Shoo them away from one section and they’ll just crowd over to another area. Those cheerful, industrious fellows know that the nectar flow is just too vast to quibble over, especially since attacking you involves literally tearing their little guts out. They’re not great individualists; any sacrifice they make must benefit the larger group. I am a great advocate of bee philosophy. Whereas the “true” grains are grasses and mature all at once, buckwheat (which is more closely related to rhubarb and smartweed) flowers and ripens from the ground up over an extended period. This creates problems of when to harvest: too early, and the upper plant is still flowering; too late, and the lower seed has shattered. If sowing is timed properly (for me around July 4), most of the seed will be mature by the first killing frost, which will begin to freeze-dry the succulent stems and foliage. I never put the clean grain away at this point but spread it on screen racks hung overhead to dry more perfectly before storing it in a tight, galvanized trash can.